February 2015 Capricorn Horoscope predicts that your independent efforts and happiness will be the dominant aspect of this month. The planetary power is in the Eastern sector of your natal chart. You can decide what you want to accomplish in life. But be sure to pay attention to build a solid psychological foundation. As majority of planets are below the horizon towards the nadir, domestic concerns along with spiritual stability will take precedence over career and profession. Influence of planet Venus is evident in your improved attractiveness and outlook, and consequent spending on expensive clothes and ornaments. The Capricorn 2015 February career predictions foretell that improving your emotional strength is necessary before you start working on your career growth. If you are looking for a job, you have to wait it out. Businessmen should postpone their recruiting program for the time being. The financial prospects for the Sea Goats for February 2015 are excellent. You will have effortless flow of money from normal as well as unknown sources. The time is auspicious for investing in old businesses, and you will get good returns. You should avoid unnecessary expenses on celebrations and partying. The Capricorn horoscope for February 2015 forecasts that love and romantic partnerships will happen during the first two weeks of the month. There will be plenty of partying during this period. Enjoy life if you are single as this might not last long. Couples in love might plan to have a baby in the next month. 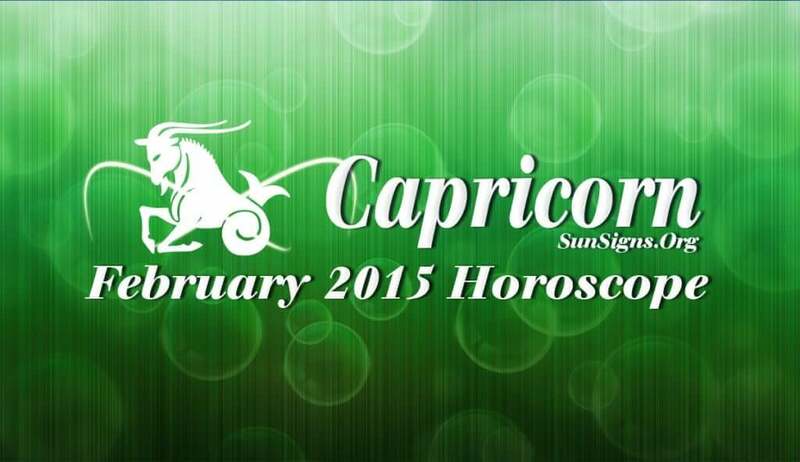 Health will be fabulous for the Capricorn zodiac sign during February 2015. It is advisable to stick to your healthy habits and exercise routine. Get more updates with the March 2015 horoscopes.